Consolidated MD’s medical consultants can provide office training, workshops and seminars to better educate your practice. They are designed to educate you office and provide team building to make your practice run smoothly and be up-to-date on many of the new regulation and laws that have been in place. Does your medical practice maintain high standards in Customer Service? We train your staff to the highest standards for patient retention, efficient scheduling, front desk collections and ultimately the “Right Attitude”. Don’t get caught without someone knowing how to perform anothers job. We cross train your staff so you know your medical practice is running efficiently even when you might be short a person. Training is ALWAYS tailored to your practice! Consolidated MD’s medical office training keeps your medical offices running efficiently and cost effectively now, and in the future. Our medical office training are accompanied by manuals to back up the individual training. Our medical office training are created for each practice, we understand that not all medical and dental practices operate the same and we develop our training based on specifically on your office. Consolidated MD benefits from the array of services we offer and perform daily. From reception with our medical answering service, to understanding billing processes to get claims paid quickly our medical consultants have the most current information to train your office now and into the future. 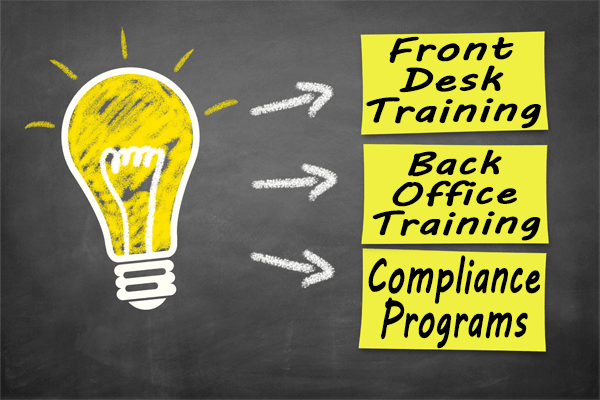 Our billers work in a myriad of different practice management systems and EHR’s affording us the opportunity to train you staff on different EHR systems.